An updated understanding of the baro-acoustic decrepitation method. Kingsley Burlinson Burlinson Geochemical Services Pty. Ltd.
Acoustic decrepitation as a means of fluid inclusion study was first used in Canada in the 1950s, and later used extensively in the USSR. The method avoids the use of microscopes and thin sections by instead counting acoustic pressure pulses as a sample is heated, which causes the fluid inclusions to develop high internal pressures and burst open. It was presumed that the formation temperature of the fluid inclusions could be ascertained from the temperature of the beginning of abundant decrepitation events. But these studies often gave decrepitation temperatures that were far too low and which conflicted with microthermometrically determined formation temperatures. Consequently the method was largely abandoned in western countries, although it was adapted as an exploration technique and remained in use in the USSR for many years. This early demise of the method in western countries was primarily due to a lack of understanding of the importance of CO2 rich fluid inclusions in mineralising fluids as well as lack of understanding of the decrepitation effect of such non-condensable gases during sample heating. With our present understanding of the importance of CO2 in ore forming fluids and our much improved thermodynamic understanding of multi-phase fluid inclusions, we now realise that the early criticisms of the method were at least inappropriate if not actually incorrect. It is therefore necessary to reconsider the method, particularly with a view to its use as a rapid analytical technique for mineral exploration. Because aqueous inclusions condense, forming a liquid phase when they cool, they will not develop high internal pressures upon re-heating until quite high temperatures, at least above their homogenisation temperatures and relatively close to their formation temperatures. But CO2 fluids do not condense as they cool, retaining high internal pressures. And from the gas law, it is clear that such CO2 rich fluid inclusions will quickly develop high internal pressures at low temperatures as they are heated, resulting in decrepitation well below their formation temperatures. 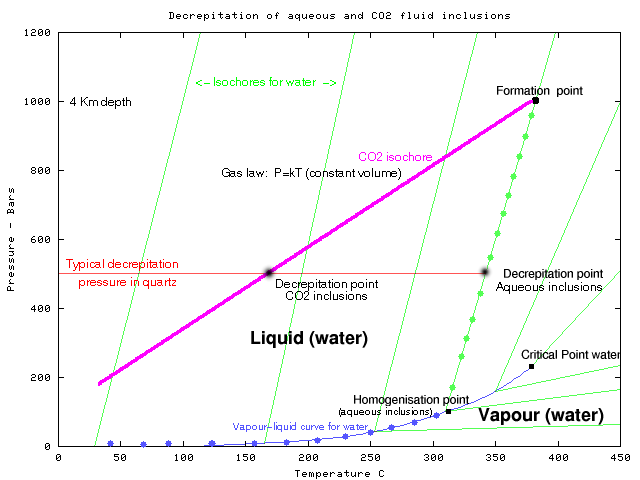 These relationships are shown in Fig 1 which compares a pure H2O inclusion with the PT behaviour of a pure CO2 inclusion of the same formation P and T. Although inclusion decrepitation depends on many variable such as shape and size as well as pressure, we can assume that decrepitation will occur when the inclusion overpressure is some 500 bars. Because P increases linearly with T in the CO2 inclusion, this pressure is reached at temperatures as low as 200 C, resulting in decrepitation at a temperature well below the formation temperature. In contrast, the aqueous inclusion contains a liquid and vapour phase at room temperature and will not develop high internal pressures until after it homogenises. The internal pressure then rises linearly with temperature along its isochore, but will still not develop high a high pressure and decrepitate until the temperature is close to the formation temperature. Although this behaviour is a hindrance in determining formation temperatures on inclusions which contain CO2, it means that decrepitation data can easily be used to detect CO2 rich inclusion populations, which is very useful in mineral exploration for Au deposits because of the commonly documented association between Au and CO2 rich fluids. (Fig 2) Other gases such as CH4 behave just like CO2 and so they contribute to this low temperature decrepitation effect. Plots of the equation of state for various gases show that they all result in high inclusion pressures and low temperature decrepitation. Statements by some authors that CH4 does not cause fluid inclusion decrepitation are incorrect and contradict the gas law. Fig. 1 P-T comparison for CO2 and H2O inclusions and their decrepitation behaviour under heating. Fig. 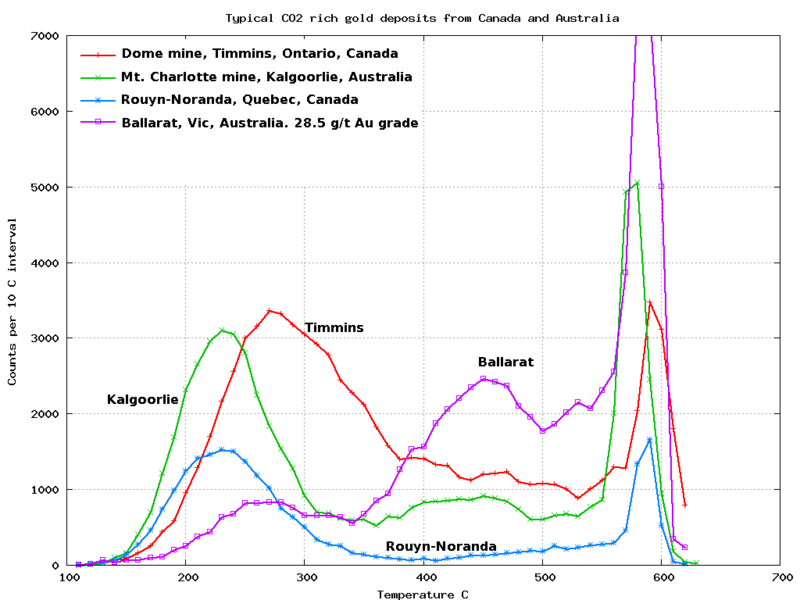 2 Gold mineralised samples frequently have high CO2 fluids with intense low temperature decrepitation. Schmidt-Mumm (1991) asserted that sounds measured in decrepitation experiments were dominated by crystallographic and grain boundary effects. This is incorrect as the instruments measure a pressure pulse in the volumetrically large air column between the sample and sensor. Changes in crystal structure or grain boundary movements simply cannot generate large enough pressure pulses to be detected. Only the rupture of fluid inclusions with subsequent release of high pressure gases or a steam explosion from superheated water can generate the pressures necessary for detection. Shear waves generated by the crystallographic changes cannot be transmitted through fluids and are not measured in this instrument. Low temperature secondary inclusions are a common problem in microthermometric studies, but decrepitation data does not show peaks which relate to such secondary inclusions. This is thought to be because secondary inclusions either leak gradually or open at low temperatures and thereby fail to generate sufficiently large pressure pulses to be detected. Consequently baro-acoustic decrepitation side-steps the entire problem of secondary inclusions and their potential mis-identification. Bodnar et. al. , 1989, compiled data which shows that most fluid inclusions can survive very high internal overpressures and that only the largest inclusions (>25 microns) decrepitate at internal pressures less than 1 Kbar. This seems to be at odds with the observed behaviour of samples analysed by baro-acoustic decrepitation, which often have 50,000 to 500,000 total decrepitation counts per gram when heated from 100 C to 620 C. To investigate this, fluid inclusion abundances were counted microscopically and compared with decrepitation analyses of the same samples. This showed that even samples with no inclusions larger than 20 microns can give significant decrepitation. It is likely that some small inclusions do decrepitate and this probably reflects complex factors such as the proximity of the inclusion to nearby fractures and the shape of inclusions which gives rise to stress concentrations at sharp points. Typically, only some 0.5% of inclusions larger than 8 microns across decrepitate and are detected during analysis. A full discussion of this is here. Despite the low decrepitation percentages, replicate analyses of aliquots of the same sample give consistent and reliably reproducible results, as shown by many years of replicate analyses of the same standard samples in the laboratory. All of this data was measured on the BGS model 105 decrepitometer in Darwin, Australia (Burlinson, 1988). However there is another operating decrepitometer of completely different electrical design, being analogue rather than digital in nature. That instrument is used by Prof. Xieyihan in Beijing. When Xieyihan used his instrument to analyse our laboratory calibration standard sample, his result was almost identical to that from our instrument, confirming that the baro-acoustic decrepitation does indeed consistently measure the fluid inclusion populations in the samples, and that the results are independent of the equipment used or the operator. 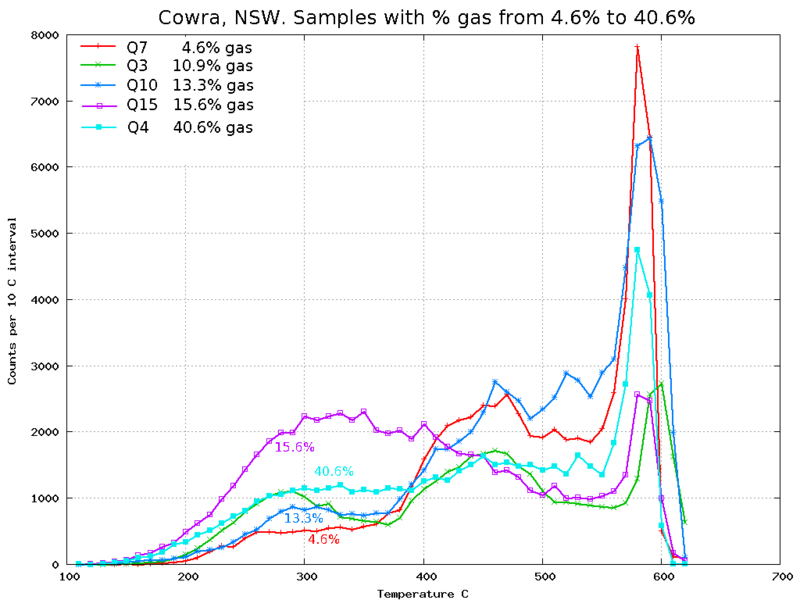 Baro-acoustic decrepitation has been incorrectly maligned and although it is not a high precision method, it gives consistently reproducible fluid inclusion population temperatures and an indication of CO2 + CH4 gas contents. As it is fast and cheap it is ideal for use in mineral exploration where large numbers of samples can be analysed to determine spatial patterns of inclusion types and abundances or for preliminary scanning in conjunction with conventional microthermometric studies. Bodnar R.J., Binns P.R. and Hall D.L., 1989. Synthetic fluid inclusions – VI. Quantitative evaluation of the decrepitation behaviour of fluid inclusions in quartz at one atmosphere confining pressure. J. Metamorphic Geol., 7:229-242. Burlinson K., (1988). An instrument for fluid inclusion decrepitometry and examples of its application. Bull. Mineral. 111, 3-4, 267-278. Mavrogenes J.A., Bodnar R.J., Graney J.R., McQueen K.G. and Burlinson Kingsley, 1995. Comparison of decrepitation, microthermometric and compositional characteristics of fluid inclusions in barren and auriferous mesothermal quartz veins of the Cowra Creek gold district, New South Wales, Australia. Journal of Geochemical Exploration, 54: 167-175. Schmidt-Mumm A. (1991) Low frequency acoustic emission from quartz upon heating from 90 C to 610 C. Phys Chem Minerals. 17:545-553.